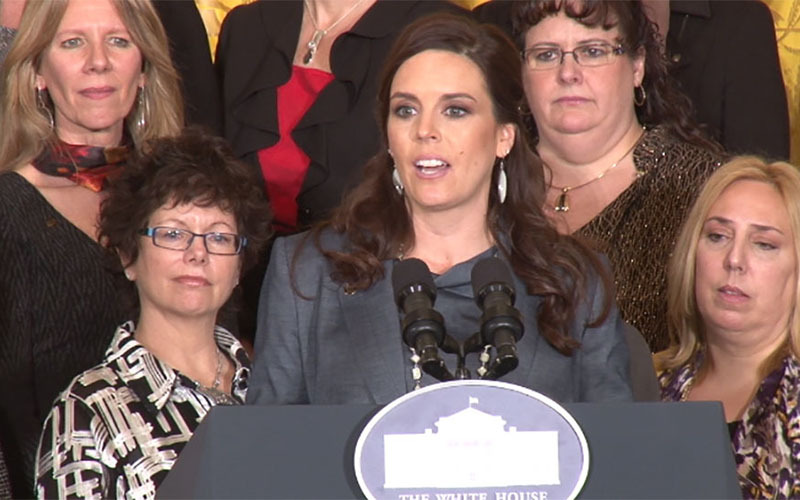 WASHINGTON – Flagstaff High School guidance counselor Katherine Pastor said it’s enough to know her work helps make a difference in students’ lives – but the hugs from Michelle Obama were probably nice to get, too. The first lady on Thursday named Pastor the 2016 counselor of the year, singling her out from 42 other guidance counselors from around the country who were at the White House to be honored for their work. “In just seven short years, Flagstaff High School has seen a 13 percent increase in college acceptance rates and a 50 percent increase in the number of colleges that visit their campus,” Obama said during a ceremony in the East Room of the White House. When asked how she felt after the ceremony, a beaming Pastor reeled off synonyms for excitement. “Today was real fulfilling, knowing that all the hours and time that you put in at your job … making students inspired to do more than what they think they can do is reassuring that I’m doing the right thing,” she said. She said the honor reaffirmed what she already knew about her job. “You know you go to work every day knowing that you’re going to work for the right reasons, and you hope you’re making a difference in people’s lives, especially students,” Pastor said. Wyatt Whitegoat is a former student who said Pastor continues to make a difference in his life, even years after leaving Flagstaff High. Whitegoat is now a Gates Millenium Scholar at Cornell College. “Even though it’s been four years since I graduated at Flagstaff High School, Ms. Pastor continues to reach out and help with any questions I have,” Whitegoat said at the White House ceremony. The event was part of the first lady’s Reach Higher Initiative, which aims to get students to get a post-high-school education. This is the second year she has honored guidance counselors, who were recognized for their leadership skills and innovation, among other attributes. Obama cited Pastor’s work to help not just her own students but those at other high schools in the district, by lobbying it to pay for counselors to attend a comprehensive college assessment training program. Obama announced at Thursday’s event that the federal budget will include an additional $15 million for the Talent Search program, to help disadvantaged youth fill out college applications and federal student aid forms.